So, with Springtime right around the corner, it is time to start thinking about planting things. When you are planting your vegetables and fruits, don't forget to feed the bees by planting some wildflowers! 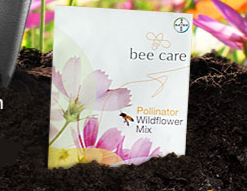 Right now, you can get a free packet of wildflower seeds to feed the bees! So cute. Each packet contains 200 seeds so you should have plenty. Click here to get a free packet. Just click on the "send me a free packet" section and enter your info. You should be all set! Enjoy!